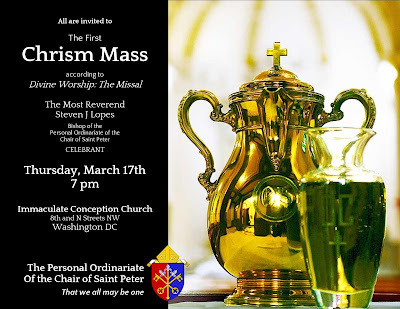 On March 17 at 7 pm, Bishop Steven J. Lopes, the recently ordained first bishop of the Personal Ordinariate of the Chair of St. Peter, will come to Washington, D.C. to celebrate a Chrism Mass, at St. Luke’s at Immaculate Conception Church, an Ordinariate parish in downtown Washington. 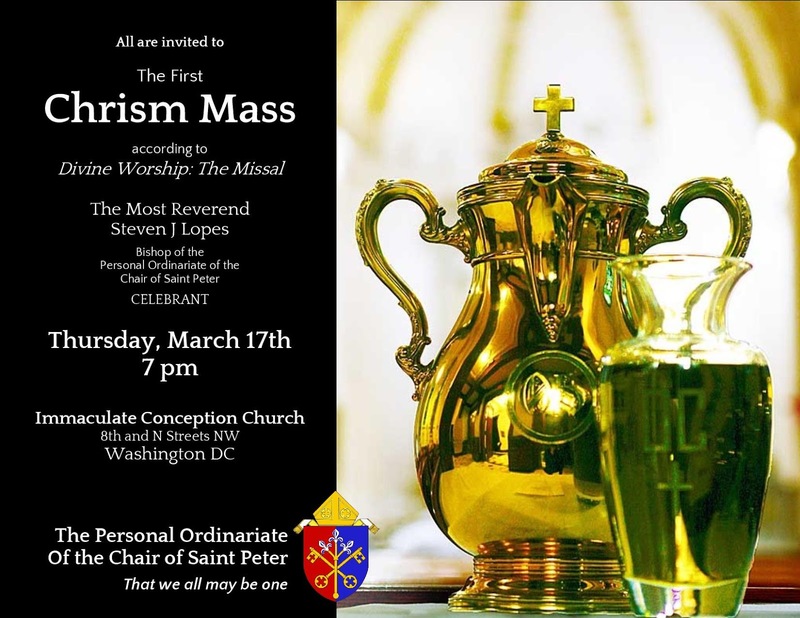 This will be the very first Chrism Mass for the Ordinariate. The Most Reverend Carlo Maria Viganò, Apostolic Nuncio to the United States, will be in attendance. As the Holy Father’s personal representative to the U.S., Archbishop Viganò’s presence at the Ordinariate’s Chrism Mass is a powerful sign of the Holy See’s support and encouragement for the Personal Ordinariate of the Chair of St. Peter. Since only a bishop can bless the holy oils, Ordinariate priests have until now obtained the oils used for anointing from the geographical dioceses in which they reside. During the Mass, the priests of the Ordinariate will renew their priestly promises, as well. The Chrism Mass at St. Luke’s at Immaculate Conception will be additionally interesting because it will be the first such Mass in the Catholic Church celebrated with Divine Worship: The Missal, the newly propagated Missal which blends language from the Anglican tradition with a fully Catholic Mass. If you are in the D.C. area March 17th, you owe it to yourself to be present for this unique and beautiful ceremony. There will be a wine and cheese reception immediately after the Mass. Mark your calendar! For more information about the Personal Ordinariate of the Chair of Saint Peter, visit ordinariate.net.